"We just lost the moon." On July 20, 1969, Apollo 11's Neil Armstrong and Buzz Aldrin landed on the moon and offered a wonderful climax to America's race to beat the Russians. People around the world rejoiced at this grand accomplishment, and NASA scored a great victory. It appeared that the astronauts had achieved President Kennedy's 1961 goal, but it was only the beginning of our moon exploration. However, the public quickly became disinterested in the moon landings and considered them "routine." Pete Conrad and Al Bean of Apollo 12 became the second group to land there in November 1969, and their success gained marginal coverage. The interest slipped even further in April 1970 when Apollo 13 launched into space to conduct the third landing. However, this lukewarm feeling would quickly transform into dreadful fascination when the crew encountered an extremely calamitous situation. Apollo 13 chronicles the triumphant efforts of astronauts Jim Lovell (Tom Hanks), Fred Haise (Bill Paxton), and Jack Swigert (Kevin Bacon) to make the journey home and overcome countless nasty obstacles. It also depicts the other side of the events—the engineers and astronauts in Houston who struggled to discover unique methods to save their guys. Gene Kranz (Ed Harris) leads the team at home and tries to keep everyone focused on each individual problem. Wearing their white shirts and glasses, the Houston crew skipped sleep and kept pushing until a solution arose. They faced extremely limited power supplies and consistent new troubles, and the chances of survival were often considered as low as 10 percent. This fictional recreation of their success offers a heart-warming tale of triumph over tremendous adversity. The story begins during the Apollo 11 landing and presents the home life of Jim Lovell and his wife Marilyn (Kathleen Quinlan), who must shoulder considerable worries during his spaceflights. He makes brief appearances at home between the countless training hours, but she must deal with nearly all the daily family issues. When their teenage daughter Barbara (Mary Kate Schellhardt) wants to dress as a hippie on Halloween, Marilyn must be the mean one and reject the idea. Jim's thoughts remain focused on the Moon, and events change considerably when Alan Shepard's ear infection places his crew on Apollo 13. This unlucky number inspires reticence for his wife, but Jim's sights are focused on the ultimate goal—landing and walking on the moon. In adapting the novel Lost Moon by Lovell and Jeffrey Kluger, director Ron Howard and writers Al Reinert and William Broyles Jr. faced a difficult challenge. Mainstream film audiences would undoubtedly not understand most of the technical jargon spoken by the astronauts and Houston. Should they present the information and take a more-realistic approach or focus more on the character moments? The end result was a compromise between the NASA terminology and more personal details. The writers did take some dramatic license in crafting extra conflicts between Haise and Swigert and skipped some of the repetitive in-space burns, but the end result is an accurate representation of their experience. Howard has never seen a sentimental moment that he didn't love, and he does pull on the heartstrings a bit too much, but these scenes never overwhelm the story's tense atmosphere. This picture succeeds largely due to the efforts of a remarkable ensemble cast who embodied the spirit of the original participants. Hanks, Paxton, and Bacon also perform solidly, but the most effective job comes from Gary Sinise as Ken Mattingly. His huge disappointment at being dropped from the flight at the last minute reverts quickly to action when his comrades need him. Sinise underplays the emotional scenes wonderfully and crafts an especially believable character. Ed Harris and Kathleen Quinlan received the acclaim at Oscar time, and they deserved the attention, but their roles are more straightforward. Clint Howard and Loren Dean also stand out as NASA engineers trying to solve the dilemma. 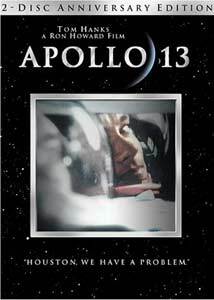 Apollo 13 received nine Academy Award nominations in 1996 and drew large crowds at the box office and on video. Younger viewers unfamiliar with the crisis learned about the stunning events through this film. In addition, the phrase �Houston, we have a problem� took on a larger meaning and is commonly used in an array of situations. This 10th Anniversary Edition gives viewers a chance to revisit the classic film and once again brings Lovell into the spotlight. Prior to the age of rampant digital effects, Ron Howard aimed to make the quintessential film about the Apollo program, and for the most part he succeeded. Tom Hanks' passion for this material caused him to produce From the Earth to the Moon, one of the best television miniseries of recent years. That ambitious 12-hour production covered the entire Apollo history and inspired audiences of all ages, including this reviewer. It stands with this film among the best depictions of a pivotal time period in the history of mankind's exploration of the unknown. This 10th Anniversary Special Edition of Apollo 13 offers two versions of the film—the original theatrical edition and the IMAX version, which runs more than 20 minutes shorter than its companion. At the time of its 2002 release, the technology prevented the placement of the entire movie on the IMAX film. Story elements were chopped to achieve the shorter running time, and this gives us less background on the people involved. However, it does offer better video and audio transfers and a shorter picture for viewers with smaller attention spans. Image Transfer Review: This release provides an surprising improvement over the solid image transfer from the 2000 version. The 2.35:1 anamorphic widescreen transfer with the theatrical option has been completely remastered. The colors are now brighter and sharper, and few flaws exist during the entire presentation. The IMAX version utilizes a 1.66:1 anamorphic widescreen transfer, and it even improves on the theatrical picture. Both options help to enhance the film's intimate atmosphere and offers an engrossing product. Audio Transfer Review: Apollo 13 is the type of film that necessitates a premier audio transfer, and both versions do not disappoint in this regard. The theatrical option includes a 5.1-channel Dolby Digital transfer that presents the tense moments effectively. The remarkable launch scene includes a powerful charge from the rear speakers that was stunning even to this veteran DVD viewer. Once again, the IMAX version raises the bar and offers a DTS track that emits greater complexity. The audio moves freely across the sound field and extremely detailed sounds throughout the presentation. Extras Review: This impressive 10th Anniversary Special Edition of Apollo 13 improves on the solid original DVD release and offers several lengthy documentaries on both the production and its history. The 1996 hour-long feature Lost Moon: The Triumph of Apollo 13 appeared on the initial release, but it remains an impressive piece. The film provides a detailed overview of the picture from the initial casting to the filming process. Following a significant look at each character and actor, it moves on to the special effects that helped to recreate the astronauts' journey. Especially intriguing is the discussion of the "vomit comet," a high-speed airplane that uses severe dips to simulate the effects of weightlessness. This vehicle actually became the setting for some shots within the aircraft and helps to increase the believability considerably. Jim Lovell and many of the crew members appear to discuss the actual events and compare them to the film product. All seem very proud of their participation in the events and feel strongly about the movie. Several new documentaries also appear on Disc 2 that were not a part of the original DVD release. The most significant entry is the 48-minute documentary Conquering Space, a compelling feature that provides a broad overview of space program's history. Especially interesting are the elements describing Apollo that might not be familiar to younger viewers. The film offers plenty of archival footage and interviews with many key participants. Narrated by Bill Curtis, the material does veer a few times into a public-relations commercial for NASA, but it generally stays focused on being informative. The other new inclusion is a 12-minute featurette entitled Lucky 13: The Astronaut's Story that offers a briefer look at the Apollo 13 history. Much of this material was covered in the Lost Moon documentary and commentaries, but it extra information is always appreciated on this topic. Transferred over from the original release are two excellent feature-length commentaries from Director Ron Howard and Jim and Marilyn Lovell. Howard speaks constantly throughout the track and exhibits tremendous enthusiasm for the picture. He avoids summarizing the plot and actually discusses the specific details of the production its history. The Lovells obviously are not experts at providing DVD commentaries, so they do leave some quiet spots during their track. However, it's priceless to have the chance to hear the real participants discuss the real-life moments depicted in the film. The remaining supplements include production notes and the original theatrical trailer. The preview for Cinderella Man, starring Russell Crowe, also appears prior to the DVD menus. Viewers who purchased the original "Collector's Edition" of Apollo 13 probably don't need to pick up this release, but it does offer new transfers and additional supplements. The IMAX edition will really pop on high-end home equipment, and space buffs should especially enjoy the experience. This 10th anniversary edition deserves a strong recommendation.